Tania Bastron grew up in Sacramento until she moved to Findlay, OH for college. She started riding when she was 6 and then during 8th grade she got her first horse, an Arabian gelding, Riley, who helped teach her dressage. Tania first started teaching riding lessons in high school. During her college years she met Cowgirl, her current horse, and helped retrain her from Western to a 3rd Level Dressage Mare. In College, Tania graduated with a Bachelor’s degree in Animals Science. 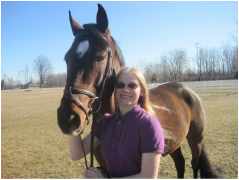 Her majors were Equine Business Management and English Equestrian Studies, emphasis in Dressage; She also minored in Business Management and Accounting. After graduating College she helped for a summer at a YMCA camp where she was a counselor and taught beginner Hunter/Jumper lessons. Tania was also the Barn Manager and Groom for a small barn for a year and then moved to a larger barn in Akron, OH for a few months helping care for the horses there. Tania returned to California for the opportunity to share her love and knowledge of horses with the students at Christiane Noelting Dressage Center.